Bring your vision to life and host an engagement party for up to 150 people from our contemporary function space. At Ellis Street Studio we love weddings. We especially love the buzz and buildup once your special someone has said yes and there’s a real feeling of excitement in the air. To complement our enthusiasm for weddings we provide an engagement party venue which reflects the joy and positivity that surrounds this most special of occasions. Our engagement party venue, located in the ritzy South Yarra/Prahran area of Melbourne, has been fully designed and serviced to host an engagement party that is sure to be looked back upon with fond memories. 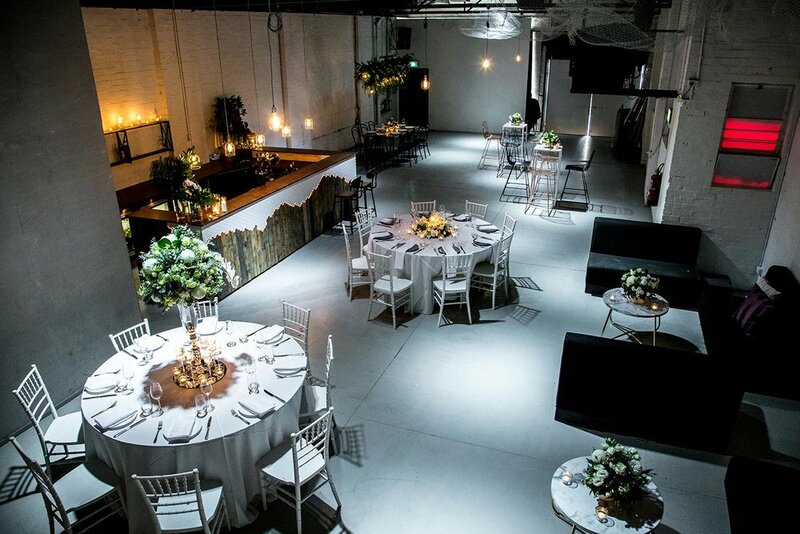 Our contemporary function space, which is able to host up to 150 guests, is a magnificently refurbished warehouse. Light, bright and with a social open plan layout, our engagement party venue is the perfect blank canvas for your to design the big occasion. Toast to your engagement with Champagne and mingle with guests over seasonal canapés and a selection of finger food. Indulge in a long luncheon featuring gourmet dishes prepared onsite in our commercial kitchen. Pop the question in front of friends and family then allow your guests to revel in the excitement from our warehouse function venue. An engagement party is one that should incorporate the joy and love felt by the special couple and their loved ones. Therefore, we here at Ellis Street Studio have created a space that oozes modern interior design, with ambient lighting and polished concrete floors adorning our sophisticated, contemporary warehouse. What’s more is that our versatile service options can cater for any kind of engagement party. Whether it be a stand up, joyous celebration of love and life, an elegant, candlelit banquet, or something completely different, our team of function staff can create an engagement party to suit your style and preference. EAT, DRINK AND DANCE THE NIGHT AWAY WITH AN ENGAGEMENT PARTY AT MELBOURNE’S LATEST FUNCTION VENUE. Click the button below to start planning your engagement party at ELLIS STREET STUDIO. Step inside from an unassuming entrance on Ellis Street and discover a beautiful function venue with all the space you could possibly need to host the engagement party of your dreams. Have Any Enquiries for Our Team? If you would like to find out more about our beautiful South Yarra engagement party venue, or would like to enquire about booking your engagement at Ellis Street Studio, please feel free to get in contact with our friendly team of staff. Fill out an enquiry form below or call us on 03 8579 0951. Our team will be happy to discuss the venue with you and produce booking arrangements.